Bison goalie Rachel Dyck in action against the Mount Royal Cougars. Both games were tight checking but the Bisons held their opponents goalless to move their record to 14-5-2-1 . The two sides battled in a war of attrition in game one Friday. The Bisons fired 30 shots on the Cougars goal and eked out a 1-0 win. Following a tight-checking first period where neither side could sustain much offensive zone time, Manitoba came out swinging in the second. The herd sent 19 shots towards Mount Royal netminder Zoe De Beauville – spurred on by three powerplays in the middle frame – but the Calgary product held her ground to keep the game scoreless. Finally, the dam burst early in the third. Bison forward Allison Sexton fired a shot on the Cougars goal, but her shot was deflected by De Beauville. Erica Rieder crashed the net, poking the puck free and past the line. The teams locked into a defensive struggle for the remainder and Manitoba held on for the shutout win. 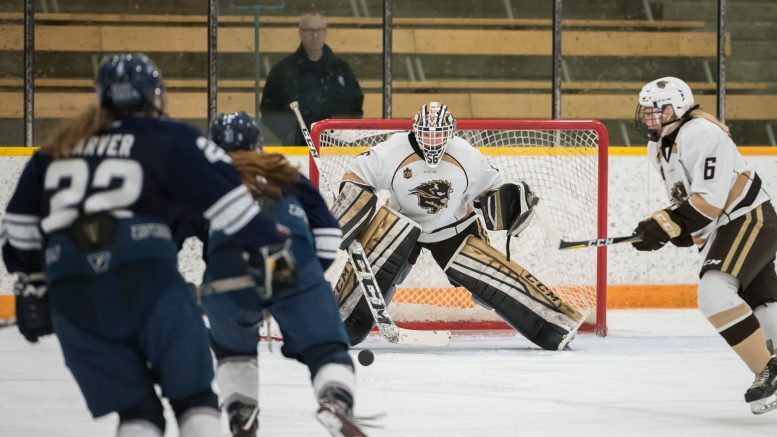 Lauren Taraschuk made 14 saves in the win, picking up her fourth perfect game of the season and taking a share of third in Canada West with eight wins. Bison head coach Jon Rempel was happy with his squad’s offensive pressure. A quick turnaround had the two sides back on the ice Saturday afternoon. Mount Royal started slow and the Bisons took advantage, taking the game 2-0 to earn the weekend sweep. Both teams made goaltending changes heading into the rematch, and the move came back to bite the Cougars early. Just over a minute into the game, Bison forward Natasha Kostenko snagged the puck behind the net, spun and sent a pass out front to Sheridan Oswald. The sophomore settled the puck and snapped it five-hole on Emily Severson to give the herd a 1-0 lead. Kostenko came back in the second to extend the Bisons lead to two. She dropped a pass to Lauren Warkentin and moved into the slot for a screen. Warkentin’s shot was blocked, Kostenko shoveled a no-look backhander on goal that went post and in to make it 2-0 Bisons. Bisons netminder Rachel Dyck matched her goalie-partner with her eighth win of the season and a 10 save shutout. Kostenko had a strong outing, recording two points – her second goal and third assist of the year – while generating numerous chances. Manitoba will travel to Regina to take on the Cougars on Jan. 26-27.